8.7 x 7.5 x 3.0 cm. A fine specimen of sharp chalcopyrites clustered beautifully on a matrix of quartz. The largest chalcopyrite is 2.5 cm across, and the scintillating lustre is fantastic on the brass-yellow crystals. Sharp chalcopyrites on quartz , contrasting like this, are actually very hard to come by. 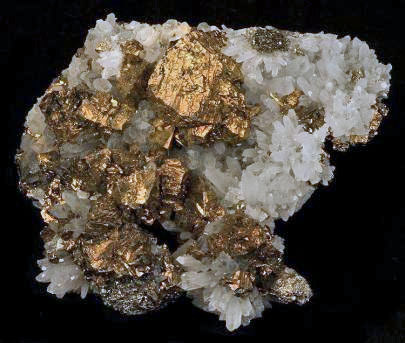 This specimen is from the Alimon Mine at Huaron, Peru, from its heyday in the 1970s-1980s. Ex. Jaime Bird Collection.